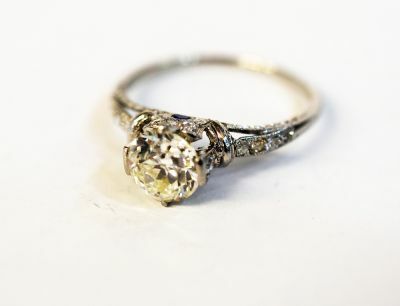 A stunning Art Deco platinum mill grain and engraved ring featuring 1 old European cut diamond, est. 1.39ct (clarity;SI1 & J colour); 20 old European/Single cut diamonds, est 0.22ct (clarity:SI2-I2 & H-I colour) and 2 bullet step cut dark blue sapphires. est. 0.10ct. Please make an appointment to see this stunning diamond and sapphire ring.